Bring My Pet offers many selections when it comes to dog-friendly and pet friendly lodging. Find a few of our favorite dog-friendly – pets welcomed lodging by following the links below. Ask any experienced pet traveler and you’ll know there is a big difference to between pet friendly lodging that accepts pets and professional pet friendly lodging that welcomes and caters to pets and pet owners. We welcome your Pet Friendly Travel ideas, reviews and suggestions. Safe travels, from BringMyPet.com. 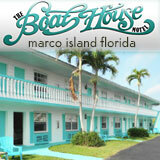 Bring your pet to enjoy nature at its best while being close to “civilization” in Olde Marco. Make use of our boat slips, cast a line from our dock and watch the dolphins, manatee and fish on the Marco River or, within minutes, sail away to the blue waters of the Gulf of Mexico. The Boat House will take you back to a time when life was simple, when outstanding sunsets were the highlight of your day. You and your pets will feel right at home. Visit sunny Florida with your dog or cat and stay at a sensational Marriott pet friendly hotel room or suite. We found Marriott Pet Friendly rooms and suites in the city of Orlando near Disney World, Tampa, St. Petersburg, Miami, Fort Lauderdale, Jacksonville, Naples and even Marco Island. Marriott members check local rates and specials by following the link below. Add Your Florida Pet Friendly Lodging Property to Bring My Pet. We found pet friendly inns, hotel suites, vacation rentals homes and pet friendly resorts in all 50 US states. Browse the BringMyPet site map and plan a truly sensational pet friendly vacation.